Dodge City, KS – – In a step toward providing a safer, cleaner working environment, Broce Manufacturing is introducing an optional fully enclosed cab for its 3-wheeled BW 260 sweeper. 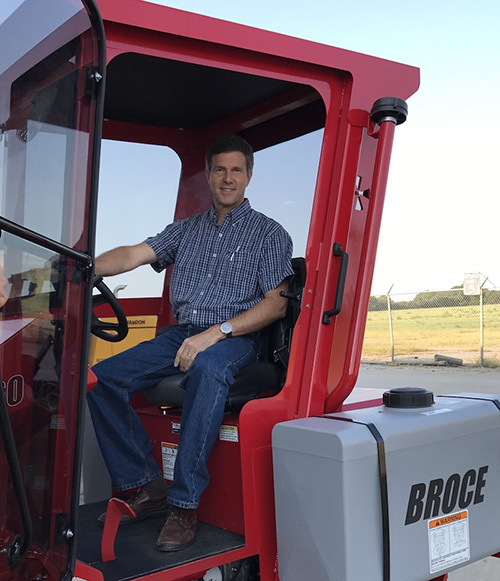 The Broce BW260 which was unveiled in early 2016 at the American Rental Association (ARA) show came with a lot of new features but was not equipped with a protective cab. Broce has taken the initiative to develop this enclosed cab as an optional feature for their 260 brooms going forward starting in September 2017. The Broce BW260 features a newly redesigned frame, hydrostatic drive, a redesigned broom swing and a larger operator area which is more ergonomically friendly. The cab addition will provide high visibility and ventilation for the driver as well as some other benefits. Want to learn more about the new cab and other features? Contact a sales rep in your area.